Gratefully serving Marin County since 2009! 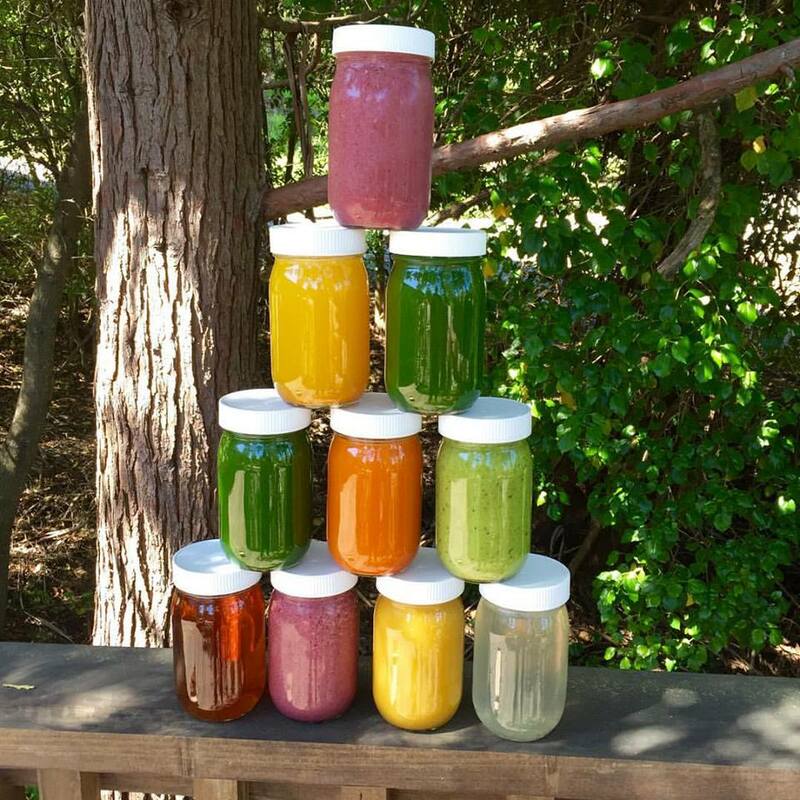 Our Green Your SPIRIT signature 5 Day Juice Cleanse package is personalized and hand-crafted in small batches with the highest quality organic produce and superfoods made exclusively to give you the best guidance and cleanse experience ever! ~ Infused with Massive Love! Each cooler is delivered the day before so you have your juices ready and with you in the morning. We deliver your first cooler on a Monday to start on Tuesday unless we make special arrangements ahead of time. Cleanse drinks generally last up to 72 hours. *Free delivery available in most areas of Marin, but not all. Email mik@greenyourspirit.com with any questions or to set up your cleanse prep session and reserve your spot! We are a small local business, and one of the very first guided cleanses in The SF Bay Area. We pay attention to quality, nutritional potency and detail to your specific needs. We love what we do, and are here to support you in this cleanse process all the way! Thank you for choosing Green Your Spirit! Popping with Flavor & Super Delicious. High in fiber and tons of essential minerals and nutrients! Ingredients: Spring water, lemon, cucumber, avocado, and other various greens, veggies, herbs, chickpea miso and spices. RAW coconut water is an incredible electrolyte drink. We crack the coconuts open ourselves! We add blue majik (phycocyanin) which makes this drink not only gorgeous looking, but packed with extra nutrients especially for inflammation. 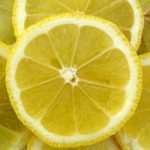 These ingredients are known to boost your immune system, stimulate healthy digestion, help with detox, and contain anti-inflammatory properties! Ingredients: Organic lemon juice, ginger juice, turmeric juice, cayenne, cinnamon, spring water, a little stevia. (drink cold or warm) – ***Energy herbs can be added to this drink for you coffee drinkers. You will get a boost without burning out your adrenals! Loaded with minerals with a delicious soothing flavor! Excellent sources of pre-digested protein (over 60%), chlorophyll, and essential fatty acids. Algae has been known to enhance the immune system, purify the blood, energize the body, balance emotions, focus the mind, and foster overall well being. LifeGive HHI-Zymes provide essential nutrients, vitamins, and minerals in a blend of stimulating, cleansing digestive aids designed to support the assimilation of foods and healthy digestion. Juices and soups are prepared fresh each day with love, and delivered the day before, so that you have them when you wake up each morning. Delivery or pick-up in most areas Marin is free. Check your area when you sign up. Delivery may include a small fee in some areas of Marin. Check for group cleanses in San Francisco and the East Bay. Group Discounts available! Juices are so fresh that they are best to consume within 72 hours! Our modern world is full of toxins. Chemicals and pollutants found in our food, water, homes and in the air accumulate in our bodies on a daily basis. This build up may cause dysfunction and an array of health conditions including weight gain, fatigue, allergies, headaches, memory, mood problems, chronic diseases and more. It is essential for mental, emotional, physical and spiritual health to rid the body of built up toxins by cleansing regularly and eating more live green nutrient dense foods and juices. Cleansing gives your digestive system a rest while giving the body a chance to release old toxins and heal naturally. Why Try the Green Your SPIRIT Cleanse? The Green Your SPIRIT Cleanse is an organic, vegan, live juice and green superfood cleanse that facilitates the body to eliminate toxins, improve digestion and normalize metabolism while you rejuvenate, alkalize and reclaim your vibrant spark! 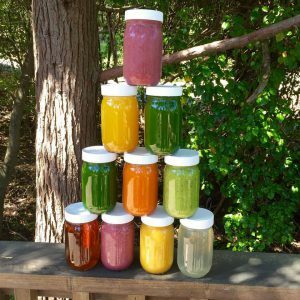 Each day, whether for 5 days or more, you will receive the energy and nutrition of whole, live, organic juices, soups and other drinks fully loaded with enzymes, chlorophyll, alkaline nutrients, protein, vitamins, minerals and anti-oxidants – all absorbed immediately giving you vibrant clean energy throughout the day! You will maintain your energy and not feel hungry on this cleanse as you are flooding your body with vital nutrients. 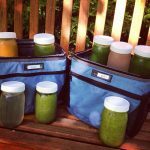 The Green Your SPIRIT 5 Day Cleanse is a great way to kick-start a healthy, vibrant lifestyle!